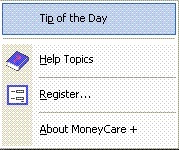 This menu includes Tip of the Day, Register, Help Topics and About MoneyCare +. 28) Tip of the Day: This will show you various Tips for using this software effectively. 29) Help Topics: This invokes the Help Topics. 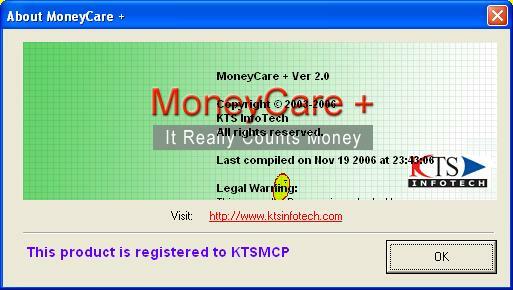 Default Shortcut Keys of MoneyCare + are shown below. Shortcut Keys are case insensitive ie. Capital letters or small letters can be used. You may also assign your own Custom Keys using Menu Shortcut Keys option given in Default Settings window. Please note Default Password 'admin' is case sensitive, ie. only small letters should be used. 30) Register: This is to enter software Registration/License details. This will enable you to make the evaluation software fully functional even after the expiration of evaluation period. Registration window is shown in Figure 38. Please note that Registration Key is different from password option in the program. After payment, Registration Key will be provided. Please visit our website to get Registration Key.